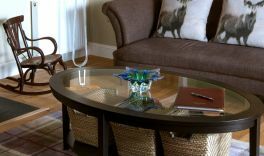 We know what we look for when we stay away from home, so we’ve incorporated all our favourite touches for you to enjoy in our luxury cottages. 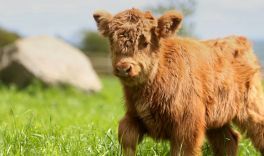 Our farm cottages reflect their rural setting: local stone and timber, soft country tones on the walls, hints of Scotland in cushions, throws and rugs. 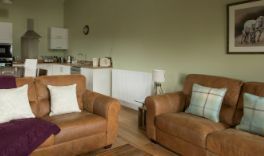 A chilled-out space in which to unwind over a cup of tea or a cheeky glass of red, immerse yourself in a good book or snuggle in for the weekend with friends or family. Relax – we’ve thought of everything. An antique French dresser and large farmhouse dining table set the scene for gatherings in Strathview’s open-plan living space. 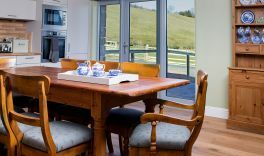 A cosy two-bedroom cottage with double aspect windows meaning twice the panoramic views from the living-room. 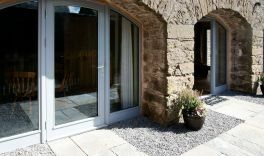 Windows snugly fit original stone arches to flood this two-bedroom cottage with light and open up views to the farmland beyond. 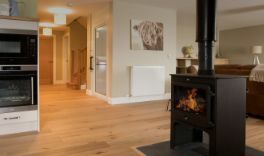 A double-sided wood-burning stove creates a seamless flow between the spacious open-plan living space creating the perfect setting for large gatherings in Ard View. 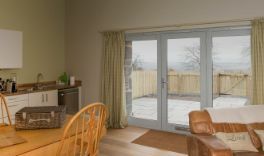 A beautifully appointed, one-bedroom, bothy-style cottage, with large south-facing glass windows and door overlooking the Strathearn Valley. 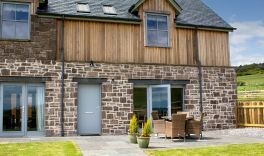 A cosy two-bedroom cottage with a south-facing view out over the Strathearn Valley – perfect for sitting out and relaxing.